When it comes to serving people experiencing food insecurity, Angela Ma, Bryant La, and Chris La are no strangers to making meals and distributing them on the streets of Oakland. 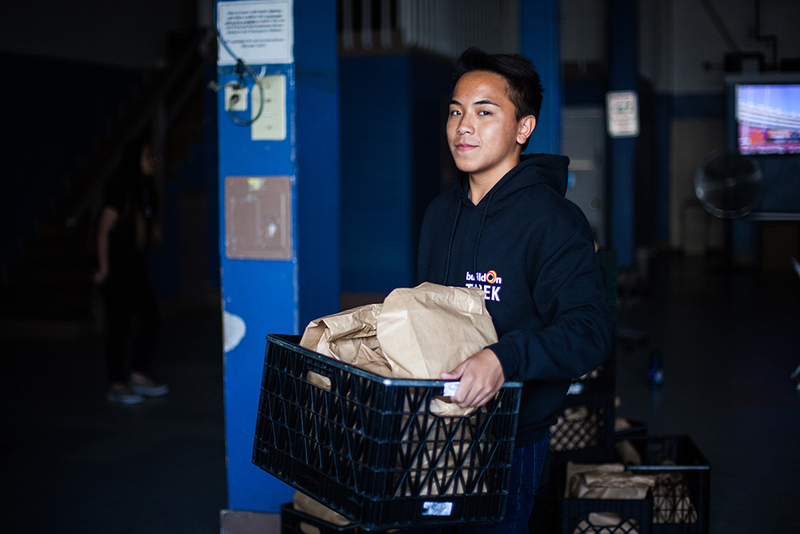 It’s something they have regularly done throughout their high school careers to serve the Bay Area’s homeless population with buildOn. So when Angela, Bryant, and Chris set out on a warm June evening with a group of students to distribute sandwiches and deep dish pizza to people in need of a meal in the Loop, they were familiar with the service project even if they weren’t familiar with the El cars rattling overhead or the crowds taking pictures in front of The Bean. After all, it was their first time serving in Chicago. Above: (From left to right) Bryant, Angela, and Chris pose for a picture in front of The Bean in Millenium Park. Angela, Bryant, and Chris spent a weekend serving and having fun in the Windy City as a celebration for all of the service they have done in Oakland. At buildOn, when a student surpasses 900 hours of service, he or she gets to take a trip to another buildOn city and serve alongside the students in that city. 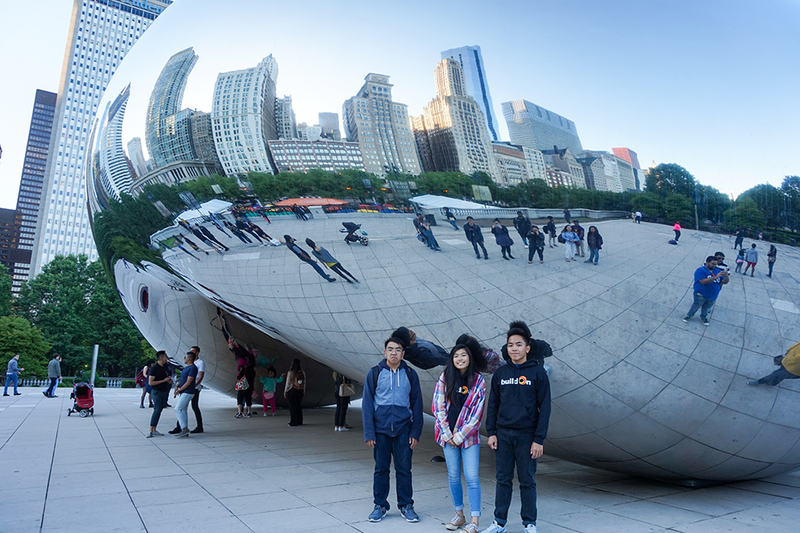 For the trio from Oakland High School, their 900-hours trip was spent meeting Chicago buildOn students, exploring the city, and serving. “It was pretty meaningful and fueled my desire to travel and meet new people,” Angela says of her visit to Chicago. 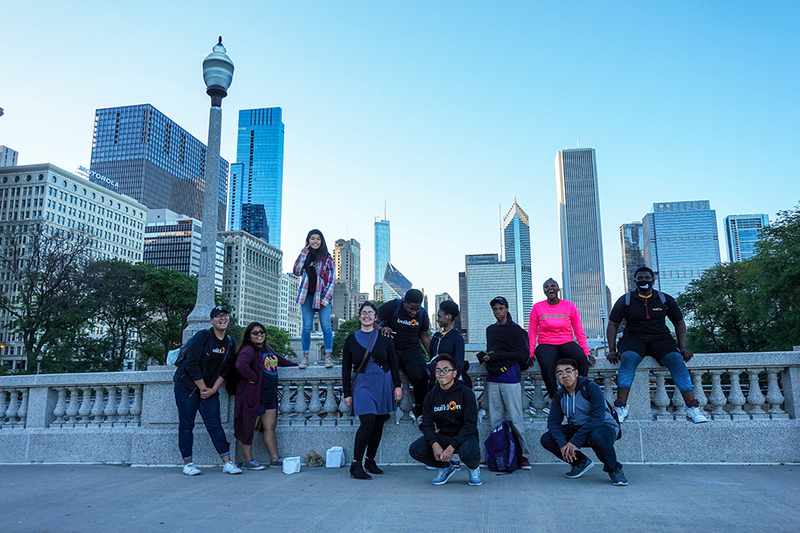 Above: Angela, Bryant, Chris, and buildOn students from Chicago stand in front of the city’s skyline after distributing meals downtown. The difference Angela, Bryant, and Chris have made through service is astonishing—combined, they have dedicated themselves to more than 3,300 hours of service. And for Bryant and Chris, both of whom surpassed 1,000 hours of service, the celebration wasn’t just contained to Chicago. The difference Angela, Bryant, and Chris have made through service is astonishing—combined, they have dedicated themselves to more than 3,300 hours of service. 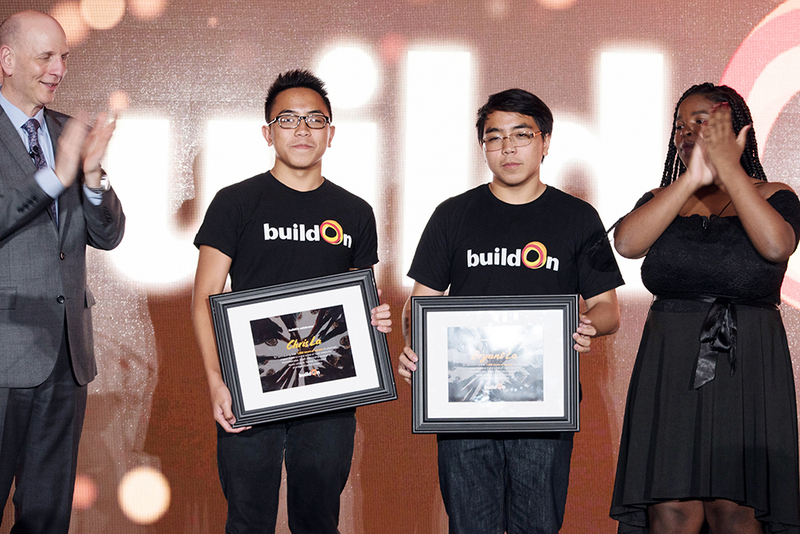 At the 2018 buildOn Bay Area Dinner, the brothers were honored on stage for their commitment to serving their city. Bryant and Chris each received awards for their ceaseless service in Oakland. And, because buildOn students who reach 1,000 hours of service get to go on a second Trek to break ground on a new school with local community members, Bryant traveled to Nepal this spring and Chris will be headed to Haiti in July. Above: Chris and Bryant were honored at the 2018 buildOn Bay Area Dinner for serving more than 1,000 hours throughout their time in high school. 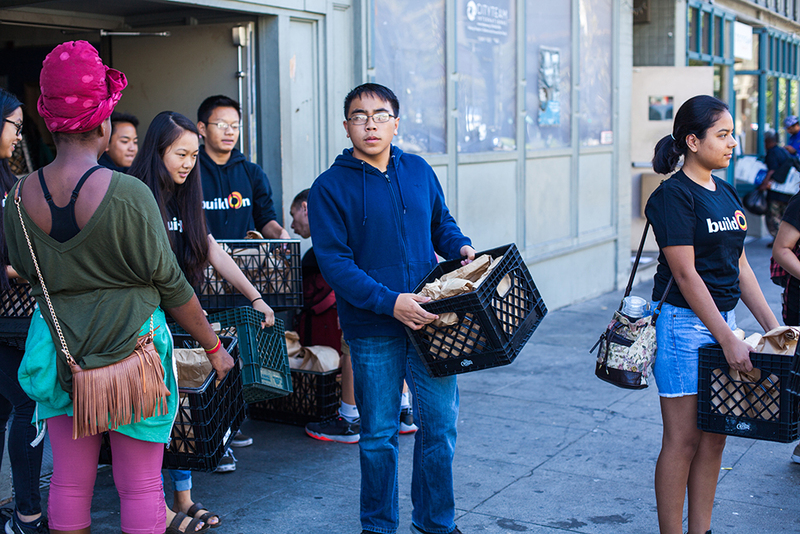 Above: Bryant gets ready to pass out bagged lunches in Oakland with buildOn students. Since joining buildOn as a high school freshman, Bryant has served 1,292 hours with buildOn. “Whether it’s 1000 hours or 1, it doesn’t matter how big of a difference you make, only that you choose to make one,” Bryant says. It’s by doing their part—plus a few hundred extra hours of service—that Angela, Bryant, and Chris have been able to make such an impact in Oakland. But even though they have achieved such incredible amounts of service, they are quick to point out that it’s a team effort. “I feel like I’m part of the buildOn movement. And that we’re helping change our communities one small step at a time,” Chris says. “One person can change the world, but not by themselves,” Bryant adds. As they head off to college in the fall—Angela to UC Santa Barbara, Bryant to UC Berkeley, and Chris to UCLA—all of us at buildOn can’t wait to see how they continue to change the world. Below: Chris prepares to distribute a crate of lunches in Oakland. “I know it’s not going to solve the issue of homelessness, but it’s making the people who are being affected by it know that there are people who care about them,” Chris says. He’s served 1,127 hours with buildOn.